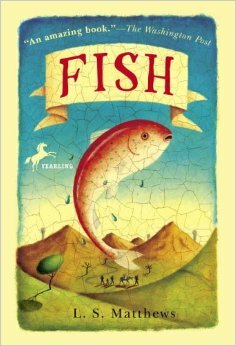 I picked up Fish, because I saw it was one of the books chosen for the Global Read Aloud. I wanted to read it aloud right away, but it was recommended that I read the book first, because there are some “iffy” parts that may be inappropriate for sixth graders. Tiger is a child (age and gender unspecified, but I guess around 10-12 years old) living in a remote area (maybe Africa?) with his or her parents doing relief work. I also assumed that Tiger’s family is from England based on the dialogue and was the narrator described situations. The village this little family lives in is disappearing due to drought, lack of food and resources, and the impending visit from soldiers (I also inferred it is a war-torn country). As Tiger is about to leave, he or she finds a mud puddle with one lonely fish, and rescues this fish in a water bottle. Throughout the book, Fish is a symbol of hope and survival. Guide, a local man who lost his entire family due to war, leads them to the border. They face many dangers, all while hungry and thirsty. However, Tiger is determined to keep Fish alive, and this hope helps the family stay focused on their journey. What I liked about this book was that it didn’t focus on details like what the family looked like, whether the main character was male or female, or what country they were in. It was their interactions and Tiger’s thoughts that mattered. It would be a great book to practice inferencing. I also like the connections that could be made… I see a STEM project in the works if I ever decide to do this as a read aloud! What I didn’t like about this book was that it had some violence that may be iffy for my students. It wasn’t too bad, but one person is shot, and the reader is left with the image of his body in mind. There is also description of guns. However, with the movies and video games our children are exposed to in the media, I think a little reality (war-torn countries, border patrol, etc.) isn’t going to hurt. I would recommend this book to someone who wanted to teach inferencing.